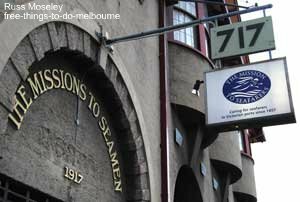 The Missions to Seamen is another building I visited during a Melbourne Open House weekend. 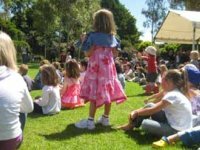 ........so the best time to visit would be at next year's Open House weekend in July as the tour was really interesting. 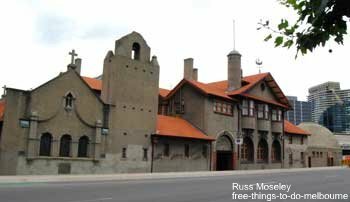 Built in 1917 by the Anglican Church, the Mission to Seamen (now officially changed to Mission to Seafarers for PC reasons) offers services for seafarers of both sexes and all nationalities. .......The chaplain didn't know why the gymnasium had been built like this (you can see it on the right hand side of the top photo). .......Unfortunately I can't find the photos I took of it. I'll add them if I come across them sometime. The stories the chaplain told about the history of this building and about the original benefactors is well worth waiting until July for. You'll find the Mission at 717 Flinders Street, Melbourne close to the Yarra river and the Docklands. .......It'll make a good day out.